Is this black ice cream spooky enough for you? Perfect for Halloween, it’s actually part of a “Goth” ice cream trend that sprang up in Los Angeles as an alternative to unicorn/rainbow ice cream trend. 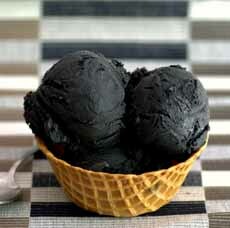 We found this recipe at Baking Bites, a technique that uses activated charcoal to make a deathly black color with any flavor ice cream. The original recipe is vanilla mint. To make it more Halloween-themed, we eliminated the mint for a pure vanilla flavor. You can make any ice cream recipe and turn it black with activated charcoal. 1. COMBINE the heavy cream, milk and sugar in a small saucepan. Bring to a simmer, stirring to dissolve the sugar. The ideal color for Halloween ice cream (photo courtesy Baking Bites). 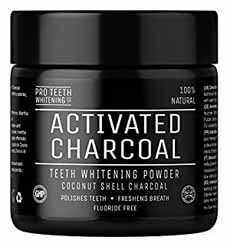 Activated charcoal, a natural, edible product, turns food black (photo Pro Teeth Whitening Co. | Amazon). 2. REMOVE from the heat and whisk in the charcoal and vanilla extract. Transfer to a bowl, cover with plastic wrap and refrigerate until cold, about 2 hours or overnight. 3. POUR the into an ice cream maker and freeze according to the manufacturer’s instructions. Eat at once or transfer to a covered container in the freezer. Activated charcoal is a very fine form of carbon powder that is has numerous purposes, including teeth whitening and water purification. The charcoal is typically made from coconut shells. It is odorless, tasteless and safe to eat. Activated charcoal has long been a homeopathic remedy for indigestion. You can find it at health food stores and online. Just don’t buy the capsules, or you’ll be spending lots of time opening them to shake out the contents! *You can substitute whole milk for a less rich ice cream.